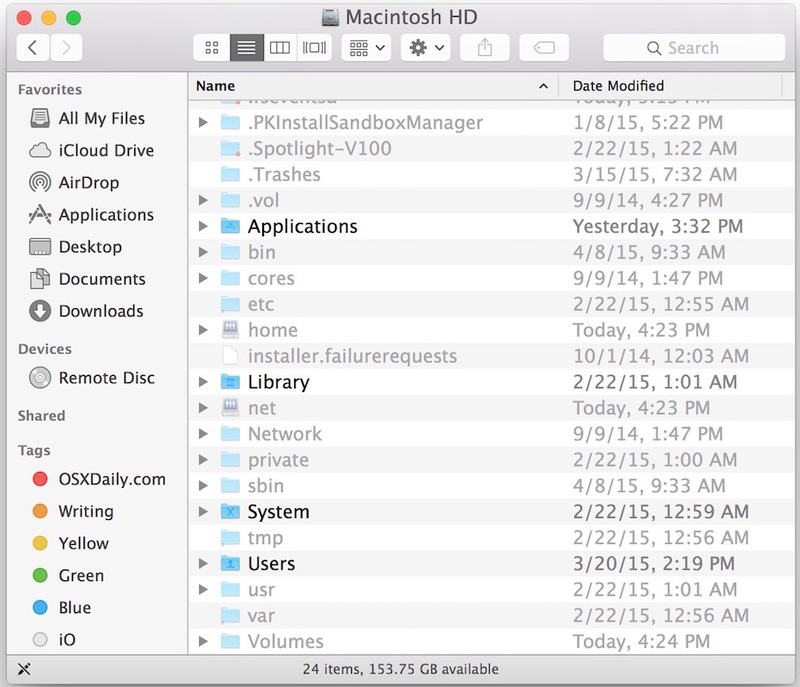 Need to show hidden files on a Mac? This is pretty common if you find yourself needing to access hidden files on your Mac, like an .htaccess file you downloaded, a .bash_profile, a .svn directory, – literally anything preceded with a ‘.’ indicating it is invisible by default – you can run the below command from the terminal to set hidden files to become visible throughout Mac OS X. For some quick background to fill in those who don’t know, files that are hidden in Mac OS are determined so by preceding the filename with a single period symbol (. ), you can actually make any file hidden by placing a period in front of the name, thus making it invisible to the Finder. Let’s walk through making all hidden files become visible in Mac OS X, regardless of what system software version is on the Mac. 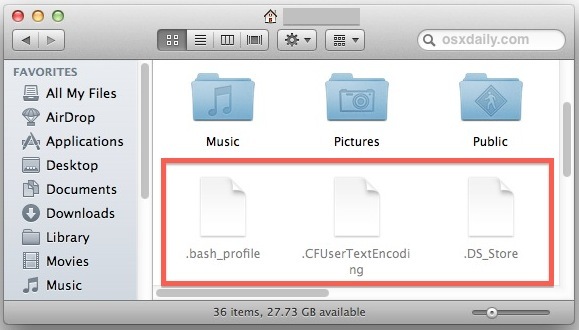 This changes the default setting of Mac OS X so that Finder always shows all files, including showing hidden files. The Finder will refresh after you hit the Return key, which causes Finder to quit and relaunch itself for the changes to take effect, thus revealing hidden files on the Mac. “Hidden” files are now visible in Finder windows, but they will display as a dimmed version of their respective file icons, being slightly transparent. Examples of how hidden files show up in the Finder are shown below. This setting stays in place until it has been reversed or disabled, which would cause all files to become hidden again just as the default. With all the files visible a Finder window can look much busier than you may be accustomed to, and it’s not always desired to leave on constantly. Thankfully it’s just as easy to switch back. Remember the Finder must relaunch to show hidden files and folders, they will appear as slightly translucent icons alongside the normal icons. The files and folders that are hidden typically will have a ‘.’ in front of their name, but other items can be hidden as well through chflags commands. Note that refreshing Finder is always necessary. This is the same in OS X El Capitan, Yosemite and old versions of Mac OS X too, the Finder must always be refreshed this way to reveal the hidden folders and files. 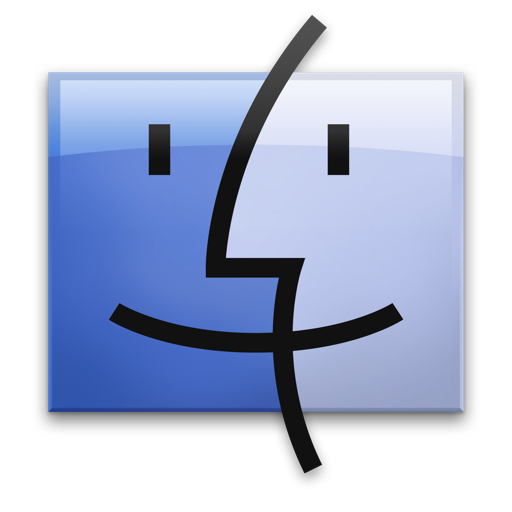 * Quick note about different versions of Mac OS X: If you look carefully, you’ll notice there is a very slight difference in casing for making hidden files and folders visible in modern versions of macOS and Mac OS X versus older versions of Mac OS X system software (com.apple.finder vs com.apple.Finder). That casing is important, however, which is why you must enter exact syntax. Hit return, and again the command will set the file visibility change and relaunch Finder so that it can relaunch for changes to take effect. That’s all there is to it! The change will revert and you’ll be back to the default with hidden folders and files no longer visible in the Mac OS X Finder. Another approach to without using the above defaults command is to quickly show all hidden files in any Mac OS X Open or Save dialogue box by hitting Command+Shift+Period on the keyboard together. You will instantly see the change as once-hidden files are revealed. That command sequence can be used to toggle back or forth, thereby revealing and hiding the files again as needed. For many users, this keystroke is the most appropriate use for when an invisible file must be modified but there is no need to make them all visible all the time. This method does not effect the Finder or the visibility of hidden files outside of using the -a flag, making it a temporary measure to quickly see all contents of any directory or folder, even if the above defaults command isn’t used. That would launch the hidden “.git” directory in a users home directory into a Finder window, without revealing all other files. Where on earth did you find that “blind” shows hiden files on mac ??? why you guys cannot be serious !!!!! Terminal comes with your Mac… No download required. It’s funny to see the self-righteous of one bash the self-righteous of another. Go Linux. Old, old, old news that, to this day, is still important because Apple doesn’t think its users need obvious ways to see hidden files. When software is written in a way that seems to imply that it knows better than its users what should be allowed (e.g. seeing “invisible files”), then the software writers are both arrogant and wrong. You have obviously never seen my mom use a computer. It is arrogant to assume that everyone has the same ability to understand tech that you do. Thanks, I used to use a third party app for doing this but I find it easy to use the Terminal command. That worked for me, all invisible files are now visible. After that, hide the folders again and you’re all set! Oh, please don’t be a crybaby ac_poster, MacOsXHints don’t owe hints and tips, they’re available for anyone – not copyrighted or nothing, so stop your whining and be happy for new Mac Users. Old ancient news you say, for whom? Those who have known for a while? For newbies it is News. – Instead consider this: Try search the internet for ‘show hidden files 10.6′. The first two hits are open/save dialogues, the third hit is this page. Instead try improving macosxhints’ GUI, it is not User Friendly when you find your tip in the comments below (jantonc).. Need to turn it on an off? I use it when working on volumes on a Mac OS X Server or other Unix boxes, typically for .htaccess files. I only need it on occasionally and don’t want the clutter or risk otherwise. From then on you can double-click it to switch between showing and hiding. Thanks a ton! I’ve been using Houdini to reveal the .htaccess files so far but it’s far more convenient to have hidden files revealed by default. Great help – thanks man! Drop the folder or file onto the sidebar of your Finder window. Now, you should be able to access it, directly and easily, in the future. this is the folder for creating huge snapshots of os which changes alot. To show hidden files, Start Property List Editor, then with it open the file /Users/Library/Preferences/com.apple.finder.plist. Look for the key named “AppleShowAllFiles”, and change its value to TRUE. Type Command-S to save the edit. Then restart the finder, either with `killall Finder` in Terminal or by re-launching Finder in the Force-Quit Applications app (Command-Option-Esc). In my case I must add that Property List Editor made it obvious to me that I had recently fat-fingered this task at the command-line: there was a Key in the plist named “ApplwShowAllFiles”. Oops. You can also you kill all on the same command line. Check out this for an example. Thank you so much for your contribution !! Thank you! Was in a pickle and really needed to see my hidden files. This command worked great. Whether this is old news or not, I didn’t know it, and I just tried it, and it worked. That is great. Thank you. On some versions of the operating system, it requires a YES to enable, and a NO to disable, instead of TRUE or FALSE. It will not give you any feedback if successful. Do a killall Finder to see the change. Thank you……. this info is really helpful ! I have a question… I saw a .dsstore and .local file on the desktop that I assume were copied there from my FTP by mistake.. after I fixed the file that was wrongly marked with the dot, is it safe to trash those ? Command+Shift+. on Mavericks doesn’t work well in column-view mode. Have to click in and our of folders. Not reliable. Works well in list view though. It’s free and works well if anyone else stumbles onto this thread. LOL giving advice to trust third party apps trust that require sudo privileges on OS X is silly. That is probably the single easier way to completely compromise the security of your entire system. What are you even talking about? This is showing how to display hidden files by using defaults commands. All defaults commands are part of OS X system modification, they are not third party and there is no requirements to use any third party anything to make hidden files visible on a Mac. More easily understood than the directions on the MAC support pages. Greatly appreciated!! Using Terminal to show hidden files on Mac killed me every time. I`ve created script files for these commands so it saves my time. Save the file and then just run it to change files visibility. Great tip, using this to show hidden files in macOS Sierra. Works exactly as described. my 3 tb airport extreme does not have such a folder (hidden or otherwise), mac os seirra. Expected “given”, “in”, “of”, expression, “with”, “without”, other parameter name, etc. but found unknown token. the only difference i see is the pasted script in the Apple Script Editor, there are no blank lines. How do I find this route? Keep in mind you should never manually delete or modify anything in the /tmp or /private folders, or anything else at the root / level of a computer!